• For quantitative determination of hemoglobin and evaluation of drug effects on hemoglobin metabolism. • Sensitive and accurate. Linear detection range 0.9 - 200 mg /dL hemoglobin in 96-well plate assay. • HEMOGLOBIN (Hb) is made of four globin chains each carrying a heme group. It is carried by red blood cells and transports oxygen from the lungs to the peripheral tissues to maintain the viability of cells. Quantitation of blood hemoglobin has been a key diagnostic parameter for various diseases such as anemia, polycythemia and dehydration. Simple, direct and automation-ready procedures for measuring hemoglobin concentration are becoming popular in Research and Drug Discovery. BioAssay Systems QuantiChrom™ hemoglobin assay kit is based on an improved Triton/NaOH method, in which the hemoglobin is converted into a uniform colored end product. The intensity of color, measured at 400 nm, is directly proportional to hemoglobin concentration in the sample. The optimized formulation exhibits high sensitivity and is ideal for measuring hemolysis in low hemoglobin samples (e.g. serum and plasma). 1. The procedure mentions that the Standard is to be diluted with water and NO reagent addition. Is the standard already converted cyanohemiglobin? How does this standard reflect OD differences after different incubation times? Wouldn’t you want to create a standard curve for extrapolation of your sample values? Our assay does not use the cyanohemoglobin method. The "Standard" is not hemoglobin itself as hemoglobin is unstable. We are using a dye at a concentration that gives the same OD reading as the freshly prepared hemoglobin at 100 mg/dL. Therefore when you apply the "Standard", there is no need to use the reagent. The changes in OD with incubation time is small if any, but we recommend reading the OD values at 5 min after adding the reagent. The standard curve shown in the protocol was read using a fresh pure hemoglobin preparation and shows that the assay is linear up to 200 mg/dL hemoglobin. Thus there is no need to construct a full standard curve. We recommend using the blank and 100 mg/dL Calibrator to calculate the sample hemoglobin concentration. 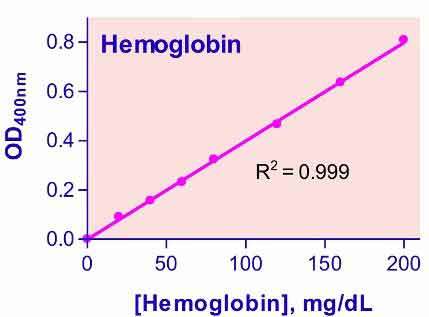 As long as hemoglobin values are below 200 mg/dL, there is no concern about non-linearity. If it is > 200 mg/dL, we recommend diluting the sample in water and repeat the assay, multiply the value by the dilution factor. 2. Why can you determine the concentration of hemoglobin in plasma using the kit? I was wondering why the color of plasma (yellow) would not interfere with the measurement of the absorbance at 400 nm. Do you have any data to show that plasma does not interfere with the measurement? The yellow color of serum is caused mostly by hemoglobin and bilirubin and our assay does not distinguish between the two. However, normal bilirubin levels will add only a relatively minor positive bias which will not elevate the reading above normal hemoglobin levels in serum (< 10 mg/dL). This kit is suitable to test for elevated hemoglobin levels in serum due to hemolysis. If you need to accurately measure the exact hemoglobin concentration in normal serum samples, you probably should take into account the background added by bilirubin. For such applications other assay kits may be more suitable. 1. Thaker PH et al (2006). Chronic stress promotes tumor growth and angiogenesis in a mouse model of ovarian carcinoma. Nat Med. 12(8):939-44. Assay: Hemoglobin in Mouse tumor tissue (Pubmed). 2. Liu D et al (2010). Puma is required for p53-induced depletion of adult stem cells. Nat Cell Biol. 12(10):993-8. Assay: Hemoglobin in Mouse tissue (Pubmed). 3. Burne-Taney MJ et al (2006). Decreased capacity of immune cells to cause tissue injury mediates kidney ischemic preconditioning. J Immunol. 176(11):7015-20. Assay: Hemoglobin in Mouse spleen cell (Pubmed). 4. Kasiappan R et al (2009). Loss of p53 and MCT-1 overexpression synergistically promote chromosome instability and tumorigenicity. Mol Cancer Res. 7(4):536-48. Assay: Hemoglobin in Mouse tumor tissue (Pubmed). 5. Liu W,et al (2009). Normobaric hyperoxia reduces the neurovascular complications associated with delayed tissue plasminogen activator treatment in a rat model of focal cerebral ischemia. Stroke 40(7):2526-31. Assay: Hemoglobin in Rat tissue (Pubmed). 6. Weis SM et al (2008). Compensatory role for Pyk2 during angiogenesis in adult mice lacking endothelial cell FAK. J Cell Biol. 181(1):43-50. Assay: Hemoglobin in Mouse tumor tissue (Pubmed). 7. He Y et al (2009). Effects of cerebral ischemia on neuronal hemoglobin. J Cereb Blood Flow Metab. 29(3):596-605. Assay: Hemoglobin in Rat brain tissue (Pubmed). 8. Frid?n M et al (2010). Improved measurement of drug exposure in the brain using drug-specific correction for residual blood. J Cereb Blood Flow Metab. 30(1):150-61. Assay: Hemoglobin in Rat brain tissue (Pubmed). 9. Meyer C et al (2010). Hemodialysis-induced release of hemoglobin limits nitric oxide bioavailability and impairs vascular function. J Am Coll Cardiol. 55(5):454-9. Assay: Hemoglobin in Human plasma (Pubmed). 10. Singleton PA et al (2010). Methylnaltrexone potentiates the anti-angiogenic effects of mTOR inhibitors. J Angiogenes Res. 2(1):5. Assay: Hemoglobin in Mouse tumor tissue (Pubmed). 11. French CJ et al (2010). Vascular rhexis: loss of integrity of coronary vasculature in mice subjected to myocardial infarction. Exp Biol Med (Maywood) 235(8):966-73. Assay: Hemoglobin in Mouse tissue (Pubmed).